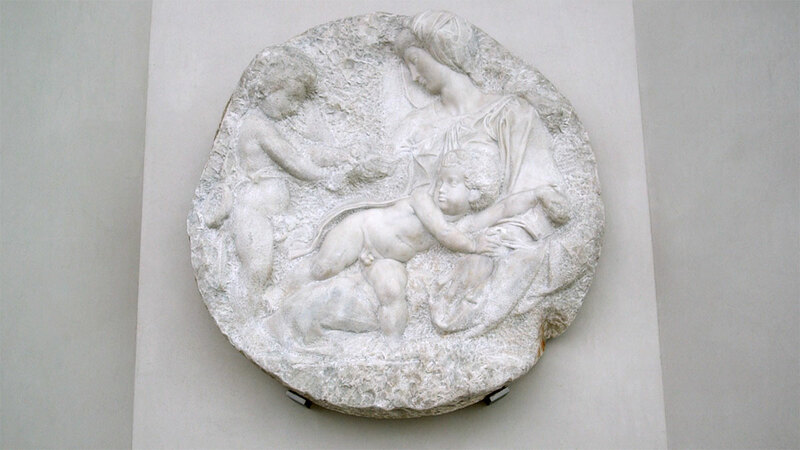 Ever since it entered the Royal Academy’s art collection in 1830, Michelangelo’s Taddei Tondo has been venerated as a tour de force of Renaissance sculpture. Commissioned in Florence by the wealthy young cloth merchant Taddeo Taddei, this circular relief was carved around 1504 (the term “tondo” derives from the Italian for “round”, rotondo). Michelangelo left the work unfinished – he probably found himself burdened with too many other projects – but that lack of completion is the reason it is relished: the tondo shows Michelangelo’s chisel ranging from spontaneous suggestion at one extreme to definitive realisation at the other. George Beaumont, the enlightened connoisseur, collector and landscape painter who bequeathed it to the Royal Academy, marvelled at the tondo’s ability to lay bare the whole of Michelangelo’s working process “from the first hint to completion”. He purchased it in 1822 from the French artist Jean-Baptiste Wicar, and then brought the tondo from Rome to be displayed in his London house at 34 Grosvenor Square. Beaumont’s friend John Constable RA, who drew a lively sketch of the tondo, described it as “one of the most beautiful works of art in existence”. Displayed in more recent years in the RA’s Sackler Wing, it remains the only Michelangelo marble in Britain. Now, for the first time in over half a century, the Academy has loaned this crown jewel of its art collection to another institution: the National Gallery. The tondo is a key work in Michelangelo & Sebastiano, the National Gallery’s fascinating exhibition that explores the creative partnership between the two Italian masters. In the words of Christopher Le Brun, President of the RA, the loan provides “fresh ways of looking at this remarkable sculpture, as well as introducing it to wider audiences, before it returns to the RA to be redisplayed as part of the Academy’s 250th anniversary in 2018”. Rather than sending the tondo back to the RA in July, the National Gallery is keeping it after the exhibition closes, where it will be included in a free display, until the Academy’s dramatic new spaces are ready in time for the anniversary. Alison Cole’s excellent book on this sculpture has just been published by the Royal Academy. “Some parts have been worked up to near perfection, others left tantalisingly roughed out and every chisel mark exposed, allowing us almost to look over Michelangelo’s shoulder as he worked this great lump of marble,” Cole tells me. “One of the many wonders is the three expressively differentiated heads, and the way they revolve around the small anxious head of a bird in their midst. This bird, held clumsily in St John’s hands and fluttering in a blur of movement, holds the key to all their reveries and reactions”. Many experts agree that it is a goldfinch, symbolising Christ’s ultimate sacrifice. So the holy Child ducks away from this winged augury and clutches the Virgin’s left arm. His anxiety is acute, and yet he stares back at the bird as if struggling to understand the full implications of his future martyrdom. Michelangelo conveys the impulsive energy powering the Child’s little body as well as his meditative intelligence. And the Virgin, who remains calm yet seems downcast by a prophetic sense of sorrow, reaches out her right arm as if to prevent the Baptist from bringing the ominous goldfinch any closer. The result is intensely moving, and centres on a direct conflict between vitality and extinction. The most difficult question centred on how best to transport the tondo from Piccadilly to Trafalgar Square. “The biggest challenge was lifting it off the supporting brackets on the wall of the Sackler Gallery,” says Davies. “We had a structural engineer design a great big stainless steel framework to contain it, and that went all the way to the National Gallery in a truck. The journey was made very early in the morning, to avoid London traffic at its worst. There was still a fear of vibrations or jolts from possible emergency stops. But the truck drove so slowly that two of us walking alongside it almost got there first!” Davies says that the journey went “wonderfully” and “not an iota of change can be detected” in the marble. Richard Cork is an art critic, historian, broadcaster and curator. Michelangelo & Sebastiano is at the National Gallery until 25 June 2017. Buy Michelangelo: The Taddei Tondo by Alison Cole in the RA Shop.